Chitwan National Park has long been one the country's treasures of natural wonders. 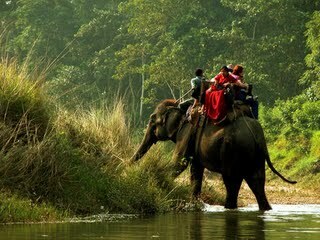 ‘Chitwan’ means in the heart of the jungle’.This is one of the most popular national parks in Nepal. The park is situated in south central Nepal, covering 932 sq. km. in the subtropical lowlands of the inner Terai. ,lying between two mountain ranges, the Shivalik and the Mahabharat range. This is the flood plain of three rivers, the Rapti, the Reu and the Narayani. The forest is dominated by Sal trees and tall grasses.In the Churia Hills pine trees predominate.The Chitwan National Park is home to at least 43 species of mammals, 450 species of birds, and 45 species of amphibians and reptiles.This is the natural habitat of endangered animals like Bengal tigers, one-horned rhinoceros, gharial crocodile, gaur (the world's largest wild cattle), four species of deer, leopards, wild dogs, fishing cats, leopard cats, python and Gangetic dolphin.The area was known as "Four Mile Forest" and a hunting reserve for big game hunting until 1951. For many years it was the Royal hunting grounds for the Kings and dignitaries of Nepal and therefore was not hunted by the general public. It did however become a favorite spot for big game safari hunters in the late nineteenth and early to mid-twentieth centuries. 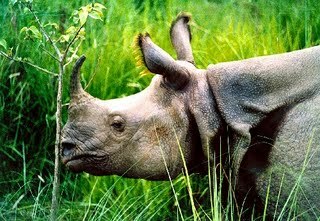 In 1973 Chitwan became Nepal’s first National Park. UNESCO declared the park a World World Heritage site in 1984. The park has a range of climatic seasons,October through February with an average temperature of 25°C offer an enjoyable climates. From March to June temperatures can reach as high as 43°C. The hot humid days gives way to the monsoon season that typically lasts from late June until September. Rivers become flooded sometime during the season the scenery looks most amazing with unexpected water level. In late January, local villagers are allowed to cut thatch grasses to meet their needs, which offer a better and easy viewing of wildlife to visitors. Also, between September and November, and February and April, migratory b irds and create spectacular bird watching opportunity. While the monsoon rains brings lush vegetation, most trees flower in late winter. The “Palash tree” known as the “flame of the forest” and slick cotton tree have spectacular crimson flowers that can be seen from a distance.The park is now a popular destination for ecotourists and includes canoeing, elephant rides, and guided jungle walks.